Evaluating a learning program is by far the best way to highlight its value to all business stakeholders. It also bolsters a culture of continuous improvement. Without measurable results, it's hard to convince the business community that its learning and development (L&D) offerings are effective. Or even necessary. By purposefully and systematically evaluating our learning programs using appropriate methods, we can prove the value of training to our organizations. In addition, it helps learning gain a seat at the proverbial table, further allowing us to help achieve defined organizational goals. Those outcomes alone should convince us to build evaluation into every one of our programs. How does evaluation prove learning occurred? How do we know the learning experience met its objectives? If you don't believe evaluation has a strong impact, you're not alone. A 2016 Association for Talent And Development study noted that only 35% of 199 talent development professionals surveyed reported that their organizations evaluated the business results of learning programs. Of the participants, 44% believed evaluation had helped companies reach their learning goal; just 36% viewed evaluation as greatly helping companies achieve business goals. How do you convince business leaders and peers that without an evaluation of measurable results, it's tough to prove that learning happened? MEASURABLE should have caught your eye above. It means that you have information (like data) that proves learning actually took place and was put into action. It shows that you are looking beyond the standard participation and completion rates or finding out whether people liked the learning experience (you know, the smiley-face survey you give at the end of the session). 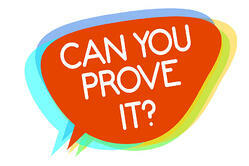 Need some proof of evaluation's usefulness? Here are a few scenarios featured in "Beyond Smiley Sheets: Measuring the ROI of Learning and Development," a 2012 report of the University of North Carolina Kenan-Flagler Business School. It emphasizes how evaluation makes clear that learning not only occurs, but that it can also exceed expectations. Texas Health Resources partnered with local colleges to improve their learning programs to make sure their staff put in place quality coordinated care. An evaluation of clearly stated metrics—the number of registered nurses (RN) passing their licensure exams, the decrease of RN position vacancies, and faster time to production—showed that, in fact 100% of nurses passed the exams, position vacancies fell from 11% to 2%. J.C. Penney implemented a learning program to bolster practices in order to raise its customer satisfaction ratings from 43%. A multi-tiered approach targeted store leaders and home office associates, with distinct messages and strategies per group. A post-learning initiative evaluation saw a customer satisfaction rating of 63%. Both scenarios offer prime evidence of impact, customer and employee satisfaction, greater productivity, economic growth, the proverbial return on investment (ROI) etc., all of which only an evaluation can accurately unveil. Evaluation not only provides data, it helps organizations to improve future offerings by more closely aligning training outcomes to business outcomes. And, as an extra bonus, it ensures that the training function is seen as a partner to the business. How do we L&D professionals gauge whether learning took place...and that learners applied it? How do we know that it was relevant to job roles and company goals? How do we know that desired performance was achieved? Think about it: results and impact are what business is typically all about. It's what they measure. How did the product sell? How did the customers like it? What can the business do better? The L&D unit has similar goals around learning, which is designed to strengthen organizational capacity. Why not evaluate to see whether that has actually taken place? Did the learning program do what it was supposed to? Did it meet the objectives? What didn't the learners understand? Where did you lose the learners' focus? What parts of the design do you need to revisit? You don’t need receive this information all at once. You collect this data over the course of the evaluation cycle by strategically collecting learner reaction data, assessing learning transfer, and measuring longer-term behavior change. Then you know if the training program truly had an organizational impact and met business goals. A learning initiative without an evaluation means stakeholders get short shrift. The learner doesn't get the point of the program. Business leaders don't see the benefits of its investment into learning and development. Designers create programs in a vacuum. Ultimately, not much changes over the long term. Recognizing the value of evaluation is step one on the path to creating an effective one. Next time we will look at critical components of evaluation—getting key organizational stakeholder buy in around learning by syncing learning and business objectives.